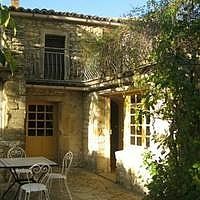 This Converted Barn in the heart of this Ancient peaceful Provencal village yet 15 minutes drive from the ancient town of Uzes with its bustling market in the central square on Saturdays, restaurants, bars, shops & brocantes! (and even Haribo Museum!). Both the Pont du Gard, the Bouscarasse Aqua Park, the Cevennes National Park, the organic vineyards of Fontareches, and the Languedoc and mounds of family fun with pony trekking and animal feeding and outdoor play parks at St Chaptes this place offers everything from a quiet peaceful get away to family fun once you venture out. Hi - I am Caroline Russell, a mum of 2 and the grand-daughter of the late painter Ena Russell who bought the barn in France in the 1950s and passed in down the family to myself and my cousin Katy. We have recently renovated the property and absolutely love going there but feel it needs to be lived in more than just our extended families so we have decided to let it out. We have a great relationship with people in the village, the local Mairee and the little old French farmer Ame who sits on his wall watching the passers by remembers my grandmother as a young lady! We hope to be able to pass this gorgeous property down for may generations to come and for guests to enjoy it themselves. At Collias you can rent a Kayak or Canoe and travel a few km on a trip under the fantastic Pont du Gard - you will be picked up at the other end. You place your belongings in water tight tubs. Notes on accommodation: Good family accommodation or for 2 couples Outside: The secluded garden with hot-tub-come-plunge-pool has a barbecue and outdoor table seating 8 for gorgeous alfresco dining Cleaning / Towels / Linen / Maid service: All linen and towels are included and the property is cleaned once a week unless you request otherwise Other: A Terrace adjoining the bedroom with outdoor loungers and view! My husband and I enjoyed everything about the house, the village it's in was as close to something I imagined when reading fairytales as a child. Caroline was a wonderful host from her tips in the area to making sure we didn't get lost finding the house. Our two small dogs enjoyed meeting their French "cousins" on our daily walks through the village and they most enjoyed staring down from the balcony at the cat that would sit in the garden. We would definitely love to come back as we instantly felt right at home and were so sad to leave on our final day. As advertised rustic and quiet ideal if you like walking or biking. We loved our stay at this little cottage. We felt so at home there; the peacefulness of the small village (yes, it's kinda remote, but so worth it), the well equipped kitchen and bathrooms, and incredibly fast wifi. I wished we had been there during the summer so we could have used the beautiful front entrance patio and the hot tub. The cottage was exactly as listed on the site, it was clean, comfortable, and inviting. We were out most everyday exploring the best of what Provence has to offer, and each night we came back to the little cottage like we would come back home. We found an extraordinary restaurant near Uzes called La Table 2 de Julien--amazing. For coffee one morning we ventured into Saint Quentin-la-Potèrie, and found a wonderful cafe called Les Cafe des Potiers--their Cafe Gourmand is the best around! If we ever come back to Provence, and I hope that we do, we would not hesitate to call Caroline again for her little cottage. A perfect stay with two little dogs. I love everything about this property. It has a wonderful quirkiness but all the comforts one requires for a great stay. A really comfy bed, the most incredible bathtub and really good towels! I have felt incredibly relaxed during my entire stay. There are some great dog walks just minutes away. I also found it to be incredibly clean. Having walked around bare foot all day I was expecting to have black feet but I didn't! I have found everything in the kitchen that I could possibly need and the Wifi is very efficient. This is just such a relaxing little cottage and it really feels like home. One can tell that it has been planned by women. Lot's of lovely pictures and also sockets near a good mirror with a chair so that hair drying and makeup are easy to deal with. Most five star hotels can't seem to get that right! The only place I really explored was Uzes and that was utterly charming. A great Wednesday market and some wonderful little shops which gave me a good fix of retail therapy. I would also recommend the Pont du Gard which was just stunning. I'm so glad you enjoyed it! That is a lovely review and you have been a pleasure! Spacious character property in quiet location. We had a very relaxing week here from 21st - 28th August this year. The house is full of character, spacious and is fully equipped to enable you to cater for yourselves if you wish to. Even though the weather was beautiful and very hot the main areas of the house remained cool, it was great having the plunge pool to cool you down too! We also enjoyed using the terrace in the evening to sit and look at the stars, a luxury as we live close to London with all the light pollution!! My husband had carried out a lot of research into the area as we are keen cyclists - although some of the roads are fairly busy we did manage to cycle along Gorge de la Nesque, which has a fantastic restaurant at the top, and also Gorge d'Ardeche which was a very huge climbing challenge for me!! We loved Uzes and even managed to find a parking place on market day! We found some great places to swim; Roque sur cez - this was lovely but probably even better out of season, Pont de Gard and Montclus - this had a very pretty hilltop village and was very quiet. I would thoroughly recommend this property if you want somewhere quiet to stay but within driving distance of a beautiful town and good supermarkets. A Rustic property in a quiet location with a shaded garden. We stayed for two weeks in August and it was hot in the mid 30's. The property is spacious with the down stairs remaining cool throughout the day. The garden has plenty of shade which allowed time to read and relax out of the direct sun. There is plenty of Roman culture to visit close by in Nimes, Arles and Pont du Gard along with Middle age history at Avignon and Aigues Mortes. A train ride into the hills was also experienced at Anduze with a visit to the Haribo factory at Uzse. There are plenty of markets to visit but be aware they cause huge traffic delays. An enjoyable time was had by all. The town has supermarkets (the very large ones are a few minutes outside Uzes), banks, restaurants, clothes shops, bars and the central Place-aux-Herbes where you can sit and enjoy food or a glass of wine while watching the children play in the fountain. Booking Notes: Once a booking is made - The balance of payment is due not less than two calendar months from the start of your booking Once you have booked and paid for the holiday it is not possible for a refund unless we can re-let the cottage at short notice. If this is the case then a proportion of the total cost will be refunded, based on what we are able to let the cottage for at that time. Changeover Day: Days of booking are Saturday (3pm) to Saturday (11am) Although this is flexible depending on availability Notes on prices: Please see pricing information - short stays are also available at half the rate of week rate - just ask!